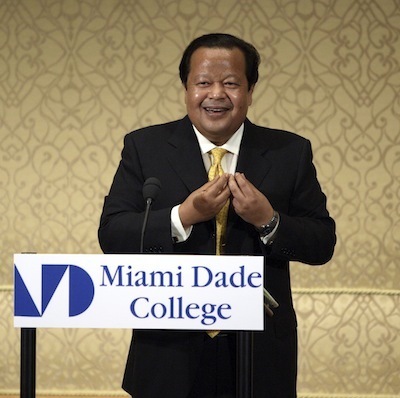 Maharaji addressed leaders and prominent members of the Miami community as well as members of Miami Dade College’s faculty at the James L. Knight Centre, Miami’s largest auditorium. Dr. Padron awarded Prem Rawat a "Key" to the City of Miami on behalf of Mayor, Manny Diaz, before a group of Miami government, civic and business leaders. Responding to an invitation from Dr. Eduardo Padron, President of Miami Dade College, Prem Rawat, known also as Maharaji, addressed a distinguished audience of faculty, guests, and students at the James L. Knight Center, Miami’s largest auditorium. MDC is the largest institution of higher education in the US with 163,000 students from 170 countries. The event benefited the World Food Programme (WFP). The Foundation’s contribution will provide food for 4,500 schoolchildren in Guatemala for a month. The sponsors for this event included Bell South, the Human Services Coalition, Mahoney Cohen, Grubb & Ellis, the City of Miami, the Four Seasons Hotel, and Miami resident artist Romero Britto. Prior to the June 16 event, Dr. Padron awarded Prem Rawat a key to the City of Miami on behalf of Mayor Manny Diaz before a group of Miami government, civic, and business leaders.